Why use a finer mesh? Non-absorbent materials do not soak up any ink so the standard 70Mesh, used for fabrics/ ceramics, leaves a ‘mesh mark’ - this is the pattern left by the strands of the mesh on the surface of the item as the ink can not soak in behind it. Pictured left is an example of ‘mesh mark’ viewed at 250%. To eliminate the ‘mesh mark’ we use a finer grade mesh that removes the strand pattern. 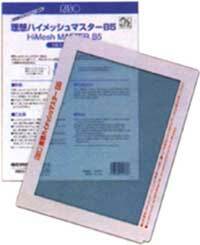 135Mesh ScreenMaster is a finer grade screen designed for this purpose, however it can not be imaged using Print Lamps, only the RISO ScreenFax systems. PRINT GOCCO B6 & B5 Print Masters are an ultra fine 200Mesh and can be used for screen printing in short run applications [up to about 500 prints]. Note: In some instances where the print quality is not required to be perfect i.e. elevated banners, standard 70Mesh ScreenMaster may be suitable for use. Prepare your artwork for imaging by eliminating any moisture and excess carbon from the design. Use the Artwork Clean-Up Process before imaging your artwork. Imaging your Print Master for screen printing is exactly the same as for Paper/ Card printing - instructions are detailed in your Operation Manual or on separate Information Sheets in the TRAINING section of the site. Do you need information on imaging Print Masters? After imaging your design onto your Print Master, remove it from the machine. Prepare the plastic frame by remove the protective coating of the double sided tape along the two long edges of the plastic frame. Leave the tape on the two short edges of the plastic frame. Tear the plastic flap from the Print Master, as pictured right, as this is not used when screen printing with the Print Master. Place your Print Master onto the plastic frame with film side in contact with the double sided tape - cardboard facing upwards, pictured left. Your Print Master is now attached to the plastic frame by the long sides of the frame. You will note the Print Master is slightly shorter than the frame - this is why we leave the double sided tape on the short sides. As the screen must be elevated for printing, the printable area of the screen decreases the higher we elevate - we cant print right to the very edges without tearing the screen! As we are using B6 and B5 Print Masters the maximum size we can print is almost the same each time. The B5 Print Master is elevated slightly higher as the larger the screen size the higher we need to elevate to stop the middle of the design ‘sticking’ when printed. Place the additional plastic frames under the attached screen and test the height, pictured right. We are trying to elevate the screen as high as possible above the item BEFORE the edges are not able to touch the item below. How hard should you press to test? You should be able to gently press down over the design area with your finger and the screen will come in contact with the item. If you are pressing too hard you may stretch/ tear the screen. There is no need for hard pressure - use the squeegee if you are unsure and simply perform a dry print [instead of using your finger to test]. 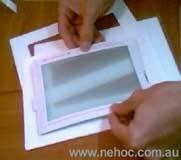 If the edges do not come in contact with the item below then remove a plastic frame. Remember, you can always increase/ decrease the height of the screen after you begin printing, as you use the straight edges of the frames for your registration [covered below] so changing height is fast & easy. By now you should have the Plastic Frames and Print Master stuck together and set to the correct height for printing. The actual printing process is the same as for screen printing plastics, excepting you must use Aqua Ink for plastics. Do not use extra pressure on the squeegee when printing - the screen will naturally lower to the item when printing. The final step is to register the print over the item, this best done using a Screen Printing Jig or set of Jig Hinges [code: S-360H]. #30 Registering single colour designs - click here . .
#31 Registering multiple colour designs - click here . .